Oceanwide Plaza the first North American development by prominent international developer Oceanwide Holdings , is set to become one of the most significant mixed-use developments in the history of downtown Los Angeles. Oceanwide Plaza will encompass a variety of lifestyle offerings including a new five-star Park Hyatt hotel, a collection of curated retailers and restaurants and a refined residential offering bringing a new level of sophistication to L.A.’s sports and entertainment district. 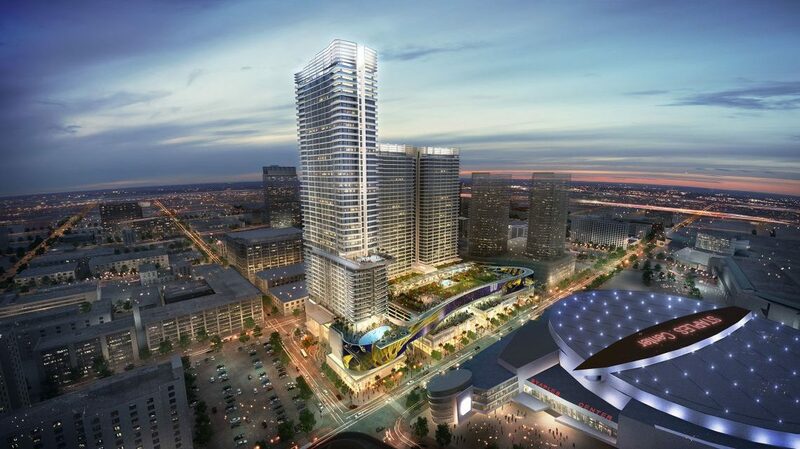 Located directly adjacent to the Staples Center and L.A. Live, Oceanwide Plaza will comprise three residential and hotel towers along with a seven-story lifestyle podium anchored by an approximately 166,000-square-foot open-air galleria creating a vibrant new shopping, dining and entertainment destination. Nearly 700 feet of ribbon-shaped LED signage along Figueroa Street will wrap the generous lifestyle center as the character-defining hallmark of Oceanwide Plaza, greeting local guests and travelers from all over the world. Park Hyatt Los Angeles will be the sixth U.S. location for the luxury global hotel brand. The 184-room hotel, including 34 suites, will feature a sophisticated character courtesy of acclaimed international design firm Studio Munge . The Park Hyatt brand’s signature approach to service and masterful attention to detail, along with its strategically chosen location within Oceanwide Plaza will offer a personalized experience yet to be seen in Los Angeles. The highly-anticipated residential offering within Oceanwide Plaza will set a new standard for exceptional high-rise living. The 504 architecturally inspired contemporary residences will provide full concierge services, along with an array of indoor and outdoor services including a private amenity deck and more than two-acre outdoor sanctuary to provide endless options for leisure, gathering, entertainment, fitness and relaxation. Scheduled for completion in early 2019, Oceanwide Plaza is owned by Oceanwide Plaza LLC, which operates as a subsidiary of Beijing-based Oceanwide Holdings Co. Ltd. one of the largest non-government controlled conglomerates in China. Oceanwide Holdings is one of the largest non-government controlled conglomerates in China, engaged in the energy, education and media industries as well as the development, management, finance, investment and sale of upscale and prominent high-rise residential and mixed-use commercial properties. Beijing-based Oceanwide Holdings sets out to provide value to existing communities in core international markets such as Shanghai and Los Angeles. The company’s portfolio includes over eight million square meters of property in various stages of development. Oceanwide Holdings’ first foray into the U.S. market will introduce Oceanwide Plaza to downtown Los Angeles, followed by projects in New York, San Francisco and Hawaii.